Finding a donor heart can be difficult. The heart must be donated by someone who is brain-dead but is still on life support. The donor heart must be matched as closely as possible to your tissue type to reduce the chance that your body will reject it. You are put into a deep sleep with general anesthesia , and a cut is made through the breastbone. 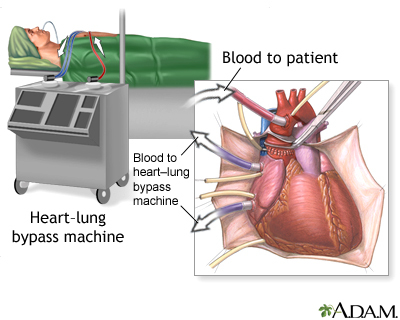 Your blood flows through a heart-lung bypass machine while the surgeon works on your heart. This machine does the work of your heart and lungs while they are stopped, and supplies your body with blood and oxygen. 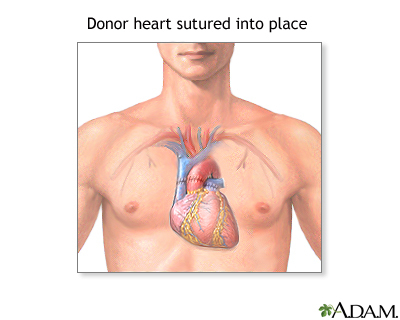 Your diseased heart is removed and the donor heart is stitched in place. The heart-lung machine is then disconnected. Blood flows through the transplanted heart, which takes over supplying your body with blood and oxygen. Tubes are inserted to drain air, fluid, and blood out of the chest for several days, and to allow the lungs to fully re-expand. Ask them how many transplants they perform every year and what their survival rates are. Compare these numbers with the numbers from other centers. Ask what support groups they have available and how much help they offer with travel and housing. Ask about the costs of medicines you will need to take afterwards. Your place on the list is based on several factors. Key factors include the type and severity of your heart disease, and how sick you are at the time you are listed. The amount of time you spend on a waiting list is usually NOT a factor for how soon you get a heart, except in the case of children. Most, but not all, people who are waiting for a heart transplant are very ill and need to be in the hospital. Many will need some sort of device to help their heart pump enough blood to the body. Most often, this is a ventricular assist device (VAD). You should expect to stay in the hospital for 7 to 21 days after a heart transplant. The first 24 to 48 hours will likely be in the intensive care unit (ICU). During the first few days after a transplant, you will need close follow-up to make sure that you do not get an infection and your heart is working well. The recovery period is about 3 months and often, your transplant team will ask you to stay fairly close to the hospital during that time period. You will need to have regular check-ups with blood tests, x-rays, and echocardiograms for many years. Fighting rejection is an ongoing process. The body's immune system considers the transplanted organ a foreign body and fights it. For this reason, organ transplant patients must take drugs that suppress the body's immune response . To prevent rejection, it is very important to take these medicines and carefully follow your self-care instructions. 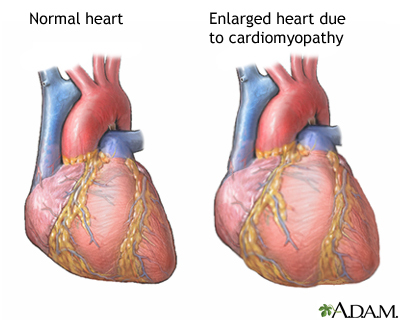 Biopsies of the heart muscle are often done every month during the first 6 to 12 months after transplant, and then less often after that. This helps determine if your body is rejecting the new heart, even before you have symptoms. You must take drugs that prevent transplant rejection for the rest of your life. You will need to understand how to take these medicines, and know their side effects. You can go back to your normal activities 3 months after the transplant as soon as you feel well enough, and after talking with your health care provider. However, avoid vigorous physical activity. To make sure that you do not develop coronary disease after a transplant, you may have cardiac catheterization every year. Heart transplant prolongs the life of people who would otherwise die. About 80% of heart transplant patients are alive 2 years after the operation. At 5 years, 70% of patients will still be alive after a heart transplant. The main problem, as with other transplants, is rejection. If rejection can be controlled, survival increases to over 10 years. Acker MA, Jessup M. Surgical management of heart failure In: Mann DL, Zipes DP, Libby P, et al, eds. Braunwald's Heart Disease: A Textbook of Cardiovascular Medicine . 10th ed. Philadelphia, PA: Elsevier Saunders; 2014:chap 28. Bernstein D. Pediatric heart and heart-lung transplantation. In: Kliegman RM, Behrman RE, Jenson HB, Stanton BF, eds. Nelson Textbook of Pediatrics . 19th ed. Philadelphia, PA: Elsevier Saunders; 2011:chap 437. Costanzo MR, Dipchand A, Starling R, et al. The International Society of Heart and Lung Transplantation guidelines for the care of heart transplant recipients. J Heart Lung Transplant. 2010;29(8):914-956. PMID: 20643330 www.ncbi.nlm.nih.gov/pubmed/20643330 . Yancy CW, Jessup M, Bozkurt B, et al. 2013 ACCF/AHA guideline for the management of heart failure: a report of the American College of Cardiology Foundation/American Heart Association Task Force on Practice Guidelines. Circulation. 2013;128(16):e240-e327. PMID: 23741058 www.ncbi.nlm.nih.gov/pubmed/23741058 . 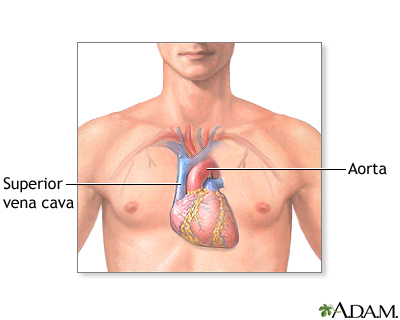 The heart is made up of the two atria which receive blood and two ventricles which are the actual pumps of the heart. The left ventricle pumps blood into the aorta sending oxygenated blood to the rest of the body. Reviewed By: Dale Mueller, MD, cardiovascular and thoracic surgeon, HeartCare Midwest; Chairman Department of Cardiovascular Medicine and Surgery, OSF St. Francis Medical Center; and Clinical Associate Professor of Surgery, University of Illinois, Peoria, IL. Review provided by VeriMed Healthcare Network. Also reviewed by David Zieve, MD, MHA, Isla Ogilvie, PhD, and the A.D.A.M. Editorial team.